A bulk email sender is an email service or email software that is used by online businesses to send marketing, promotional or educational emails in large amounts. This sender allows a company to create one email and send it to hundreds or thousands of addresses at once or write a unique email for each subscriber on a mailing list. Today, email services are more popular than bulk email software. While both email sending platforms can send emails in huge quantities at a time, that is about all that the email software does. Email services, on the other hand, come with additional features. For one, an email service allows its customers to create and manage email lists. So, one can easily add new contacts to their mailing lists, when new subscribers opt-in for marketing content, clean up the list to remove non-viable addresses or segment recipients according to a particular criterion. When using email software, one must install additional programs to perform most of the functions that an email service does. Therefore an email service is convenient. While both require updates from time to time, email services perform them automatically without the users incurring any additional costs. Software, however, requires the user to pay and install any new upgrades. Therefore, it is not only convenient to use a service instead of the software but also affordable. SendPulse is an excellent example of a reputable and reliable email service that allows for bulk email marketing automation. Compare prices. How much does the email company charge for its services? For any business, the cost of investment as compared to the expected return (ROI) should be a top priority. Choose a service provider that offers needed help within what the business can afford. SendPulse, for example, has several affordable pricing plans to choose from based on the number of emails one wants to send. For less than 2,500 subscribers, businesses can send bulk email for free! Look into domain reputation. When working with desktop software, the immediate issue is non-existent domain and IP address reputation, which will likely result in your emails going to the spam folder. Online services usually handle this problem without your participation required. Check for email templates. An email template saves much time when creating a bulk email campaign. They are reusable and can be customized for multiple purposes. So, choose a service that offers a wide variety of templates for different email marketing goals. SendPulse has lots of pre-designed templates that can be edited and used for free. Ensure mailing list management is available. A reliable service is one which offers mailing list management. It should help users to identify invalid contacts, delivery errors, spam reports and so forth. Pick a service that allows users to perform functions like the removal of recipients who unsubscribe, adding new subscribers to the list and list segmentation. Look for email automation. Automated email campaigns are usually set up once to send automated email messages to a specific individual once that person performs a particular action. It is different from one-off marketing campaigns and newsletter sending in that it must be triggered. For example, when a visitor signs up, an automatic confirmation email is sent to verify their subscription also known as double opt-in. Other examples of automated emails include welcome emails on signing up, thank you emails after a purchase, and reminder emails. Learn how to automate marketing functions using SendPulse 360! Discover more about the differences between an email service and software in this article. Segmentation: involves grouping subscribers according to age, gender, location, potential or existing buyer, and so forth. Personalization: ability to create content that is valuable and targeted for a particular customer. A/B testing: assesses two variants of any part of the email to determine which one performs better than the other. 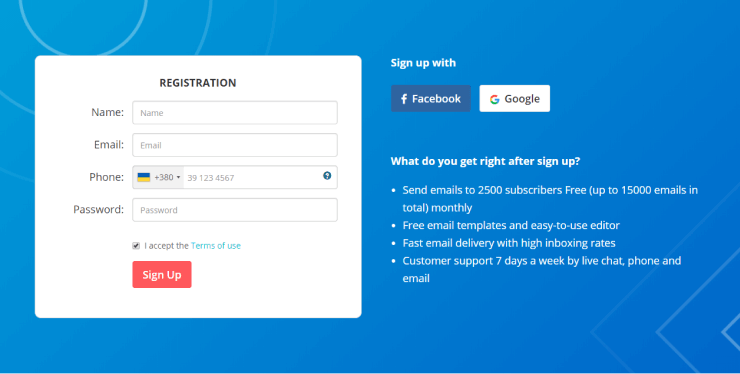 Subscription forms: enable brands to grow their mailing lists by collecting new subscribers. Mailing list importing: involves moving an existing mailing list to a new campaign. Reporting: includes metrics on the performance of a specific email campaign. Click "Sign up" below the free pricing plan. Proofread the message body for any spelling mistakes and counter-check that the sender`s address is correct. Finally, send the email! Also searched with "Bulk email sender"
Rate this article about "Bulk email sender"
If you are interested in "Bulk email sender" you might be interested in our bulk email service.